Last Saturday, 30th June, we held the second of this year's virtual hackdays, with physical presence an option at the Shadowcat offices. 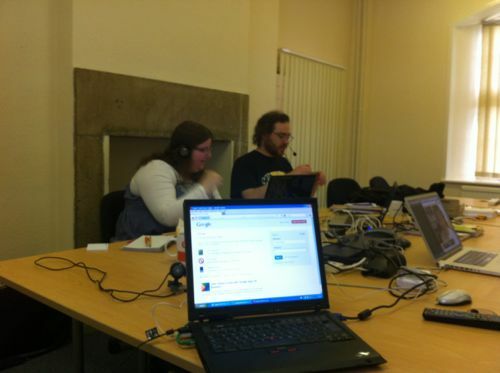 This time around we had castaway, robinsmidsrod, idn, clairejackson, mithaldu and myself working on Presenting Perl and Ironman with some other organising material for Enlightened Perl Organisation. Corrected time displays, fields in the tables, link contrast and display, breadcrumb trail (pebble trail) and static links on the PP pages. Created the admin upload interface and embedded a video using the interface and tested it displayed on the page for PP. Integrated RSS (stage 1) for PP. Upgraded the core code, perlanet, for Ironman and sent to staging. Created a new template for the mailouts and updated the design for the members area of Enlightened Perl Organisation. Changed and updated the design for Presenting Perl and Ironman - stage one changes. Announced the send-a-nebie initiative and did some minor organisation of the same. There were a few decisions we made on the day regarding future hackdays. One of these was to make sure we have a pre-hackday meeting in channel to make sure everyone has the right tools and items installed and decide on which channels and times we would convene to make it easier to get started on the day. But, that aside, the day was a great success, we managed to achieve a number of tasks and to lay the groundwork for future upgrades. It means that the next hackday should result in even more being achieved. I am hoping that we will all find a bit of time to work on the projects in the meantime so that we keep the momentum going. I would like to thank all the people who turned up and hacked on the day, and thanks to Ian and Claire for coming to join me in physical presence for our virtual hackday at the SC offices.